Custom caricature ready framed with glass at back ready for signing! Samples based on 11x14 dimensions with 4" mat. 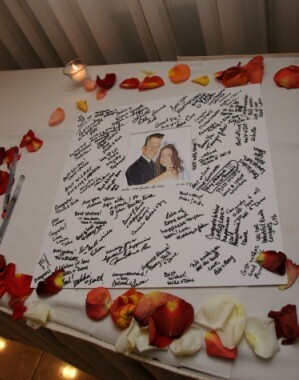 Sign-in boards are hugely popular at weddings and other events and provide a lasting memento of the special occassion. Much more fun than just a sign-in register at the reception, Caricature King makes getting the ideal wedding sign in board a simple task! Also ideal for retirement and birthday gifts - with plenty of room for people to write their best wishes messages!! 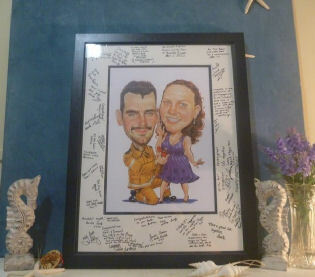 Your cusom caricature is printed using high quality printing processes and then framed in a moulded black wooden frame, foamcore backing amd dust cover backing, wall savers and hanging wire. Quality clear acrylic UV-resistant glazing is inserted behind the image so that after the event, you can easily remove and place in front, ready for hanging in your home. Simply choose from one of the packages below! 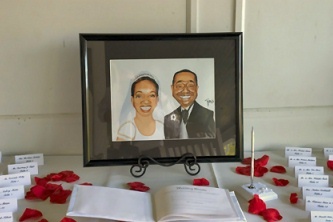 These prices include the artwork for two full bodies with minor prop (*add $30 for background*), printing, framing and delivery to mainland USA. AUSTRALIAN customers, please email Matt for prices. Please allow up to 15-25 days for delivery of the framed product from original date of order. Often it is sooner, but this cannot be guaranteed. If you want a different mat color or width, frame style or print size - just ask!